A SpaceX Falcon 9 rocket stands topped with an unmanned Dragon space capsule - the first commercial spacecraft ever to launch to the International Space Station - on May 17, 2012. 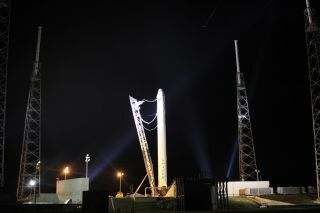 The rocket and Dragon are due to launch on May 19, 2012 from Cape Canaveral Air Force Station, Florida. The private spaceflight company SpaceX is preparing to launch an unmanned capsule to the International Space Station this week on a demonstration flight that could mark a turning point for the commercial spaceflight industry. SpaceX's robotic Dragon capsule is slated to blast off atop the company's Falcon 9 rocket Tuesday (May 22) at 3:44 a.m. EDT (0744 GMT) from the Cape Canaveral Air Force Station in Florida. It will be the second launch attempt after an initial try was aborted at the last second due to a rocket engine glitch. This year, the company is celebrating its 10th anniversary and has a $1.6 billion deal with NASA to provide 12 unmanned cargo flights to the International Space Station. Another company, Virginia-based Orbital Sciences Corp., is also under contract with the agency to provide supply flights to the orbiting lab. This SpaceX photo shows the 'secret payload' - a wheel of cheese - that rode into space aboard the company's private Dragon spacecraft during a Dec. 8. 2010 test flight. The cheese rode inside the Dragon capsule for the entire flight, from the launch in Florida to splashdown in the Pacific Ocean, 500 miles (804 kilometers) west of Mexico. After the mission, SpaceX released photos of the cheese wheel, showing it inside a metal cylinder with a cover secured by bolts.